Note: This example cannot be run with a GfK map data set. The glc codes are replaced by ISO codes and are not supported for GfK mapping. This example shows how to subset a single country from the MAPS.WORLD data set. This is useful for mapping smaller countries that do not have an individual map data set in the MAPS or MAPSSAS library. This example also demonstrates how to use the GLCNSM. format to specify a country by name rather than by its ID value. Enable the formats from the SASHELP.MAPFMTS catalog. 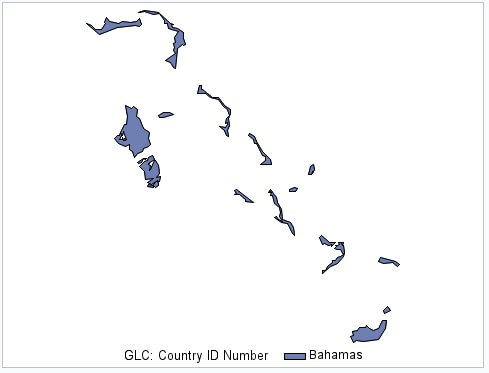 Subset the map data for the Bahamas from MAPS.WORLD by using the SQL procedure and the geographic locator code format (glcnsm). Create the map by using the GMAP procedure.The STATISTIC= option specifies that the GMAP procedure will match the first observation from the MYMAP data set and output the response value from this observation only.